We help people with all levels of experience become stronger than they’ve ever been. Since training with Grant I have seen significant improvements in my strength and form. Initially I was a little nervous to start going to a barbell gym, but everyone here is so welcoming and encouraging. I will definitely keep coming here! There is a productive sense of focus in the training groups of 7, the people making up these groups traverse a broad range of physical abilities and opportunities, sizes, ages, genders, senses of humor, etc., and the personalities ring through. There’s plenty of laughs and camradarie through the training sessions. Indeed there is no sign of the drudgery of globo-gym type “exercise” at The Strength Co. I cannot say enough about this place. Training here has not only made me bigger and stronger but I have fun while doing so. Not only that, but I’ve made some good friends working out here. Whether you’ve never lifted weights before or are a seasoned athlete, we can help you safely perform your exercises and make progress. We’ve taught hundreds of people to squat, press and deadlift successfully. Every individual’s work set is performed under the watchful eye of one of our experienced and encouraging coaches. Encouraging and supporting other lifters helps to keep everyone energized throughout the session. We understand that most people can be intimidated by the idea of strength training. Our coaches will make sure every lifter achieves steady progress with an individualized pace. They will also make sure you perform your lifts safely, with proper form. Our Intro to Barbells Class is a 2 hour introduction that teaches you all the basics of resistance training and how to safely perform the major barbell lifts. Trainees will be coached in real time in the Squat, Press, Bench Press and Deadlift by one of our experienced coaches. Intro classes are $200 per person and students are welcome to join our group classes afterwards. Members can attend group classes Monday-Saturday, offered both in the mornings and evenings. Our attendance is capped at 7 people per class so that our members get personalized, one-on-one coaching for their work sets. Single visit passes are also available for those who have completed Introduction to Barbells. After witnessing the results of Starting Strength in his own performance, and in that of his Marines, Grant obtained the Starting Strength Coach Certification in April of 2016 and opened a garage gym to train the general public and then opened The Strength Co.
Dylan is one of our proudest success stories here at The Strength Co. After battling several serious health issues and coming off of chemotherapy, Dylan was looking for a way to rebuild his health when he discovered Starting Strength. Dylan started training in January of 2017 with an empty barbell (45lbs) and nine months later was squatting and deadlifting over 400lbs, with improved body composition. 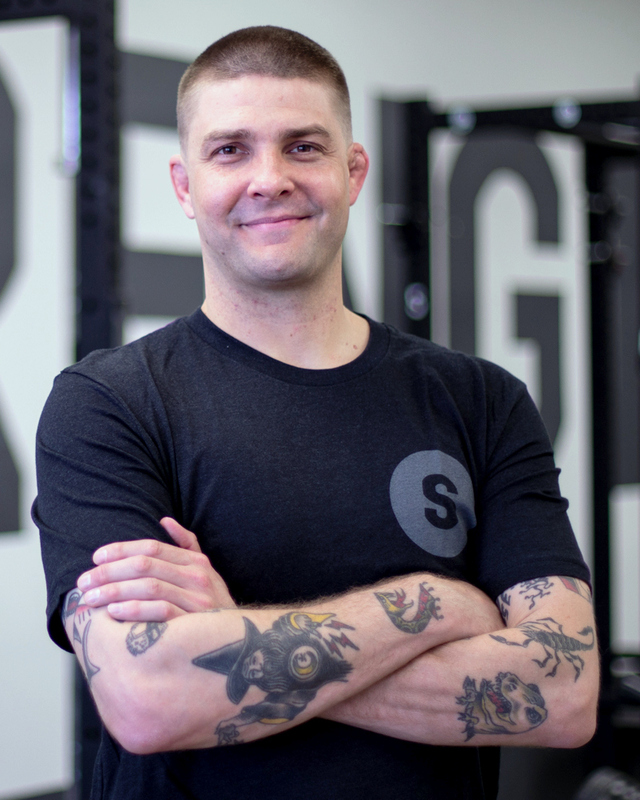 After witnessing first hand how strength training changed his own life, Dylan decided to dedicate himself to coaching in order to help other trainees achieve their genetic potential. Dylan completed the Starting Strength Seminar in January of 2018. Check out Dylan’s full story on YouTube. Coach Jeff is a Brazilian jiu jitsu brown belt and instructor at the renown Art of Jiu Jitsu Academy in Costa Mesa, CA. While looking for a way to become bigger and stronger to improve his jiu jitsu game, he found the book Starting Strength. He attempted the program on his own but soon realized he needed a coach, and enrolled for his Intro To Barbells session in December 2017. He loved barbell training from day one, and has never looked back. He has gained 40 lbs of body weight, vastly improved his strength, and has seen a significant carryover to his jiu jitsu game. Because of his background in coaching Brazilian jiu jitsu, Jeff picked up on the details of barbell training quickly and immediately started developing his coaching eye. He is passionate about coaching and helping others reach their potential. Andrew discovered Starting Strength in 2014 as he was looking for a way to strengthen his back and protect himself from injury. After coaching himself for four years, he joined The Strength Co. in April of 2018. A long time high school basketball coach, Andrew understood the importance of coaching, and how much immediate feedback can improve ones performance. A believer in the importance of strength for lifters of all ages, Andrew attended the Starting Strength Seminar in June of 2018 before beginning to intern at The Strength Co. Andrew is a mechanical engineer by trade, and lives locally with his wife.